My peers and I have access to more information about our bodies and our health than ever before, encouraging us to take care of ourselves and make well-informed decisions. But informed and well-informed are not the same and sometimes Google searches can be disempowering—particularly when the top hits promote pseudoscience, debunked claims, and the opinions of quasi-experts presenting themselves as leaders in their field. This overload of bad information—and the pressure we feel to be the healthiest, happiest people we can be—can even make us feel more anxious. And social media can make a competition out of it. Paid Instagram influencers encourage juice cleanses and SoulCycle, while 20-somethings pay larger and larger chunks of their paychecks aspiring to live up to this ideal. 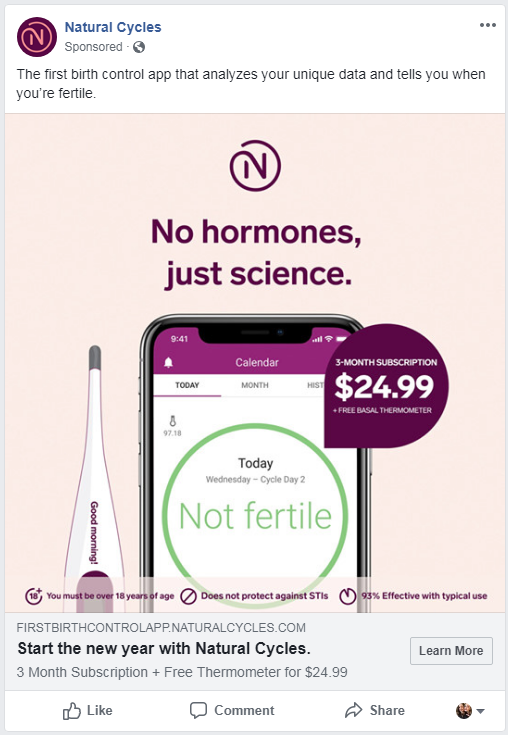 As I started my investigation into Natural Cycles’ FDA clearance earlier this year as the policy fellow for the NWHN, I quickly became inundated with ad after ad encouraging me to see how Natural Cycles is right for me. Make an informed choice! My first thought, obviously, was “is my phone listening to me?” But my boss didn’t get these messages. So what makes me Natural Cycles’ target? My age, my interests, and my socioeconomic status, among other factors. On Instagram, I follow vegan blogs and yoga instructors, as well as feminist authors and body-acceptance promoting illustrators. I have downloaded meditation, fitness tracking, and calorie-counting apps. I am clearly hyper-aware of my own well-being and interested in how to improve it—even if I’m not always doing it. In short, I am part of the “wellness generation.” Studies show that young adults want to spend money on experiences instead of material products, so brands sell us on a way of life—often with a hefty price tag attached—promoting a holistic lifestyle from food and fitness to sleep, medicine, and now contraception. The wellness industry is worth anywhere from $30 billion to $3.7 trillion. There are legitimate reasons, rooted in feminism, why young women may be suspicious of institutional medicine, with its long history of over-medicalizing our bodies, undermining and even criminalizing women caretakers like midwives and doulas, selling us products only tested in men, and lying about the side effects. In fact, the NWHN’s founding fight was demanding the right to good information about the dangerous side effects of early, high-dose formulations of the Pill. The United States has profoundly medicalized maternity care, yet has the highest maternal mortality of any developed country—and overmedicalization may well be the problem, not the solution. Skeptics also question the medicalization of behavior and hyperactivity. So it’s not surprising that many women seek out “all-natural” remedies, like the kind promoted by pseudo-science profiteers like Gwyneth Paltrow’s Goop. The movement is grounded in the idea that “natural” is synonymous with “healthy,” and that the words chemical and toxin are one in the same. At the NWHN, we’re careful to stake out a balance between women helping women without the intervention of the medical establishment—including using traditional remedies—and exploitative quackery built on fear-mongering. And we know that “natural” can be little more than an unregulated branding gimmick unsupported by science. Arsenic is all-natural, after all, as is radon and asbestos. And of course, even pure water can be made to sound scary. That’s why we follow where the science leads us. And why we’re skeptical of companies like Natural Cycles that claim to “empower every woman with the knowledge that she needs to take charge of her health,” but help spread myths about contraception that harm women’s ability to make informed choices. She’s alluding to a harmful and pervasive myth, pushed by bloggers and Instagram influencers, that it is necessary to take a break from hormonal birth control. And her users have followed her lead: “I feel great using this too because when we start trying to get pregnant (3 years away but still) I won’t have to detox my body from the pill…” In reality, the long-term use of hormonal contraception does not change its effectiveness or cause infertility, and there’s no need to stop using hormonal birth control years before you want to get pregnant. 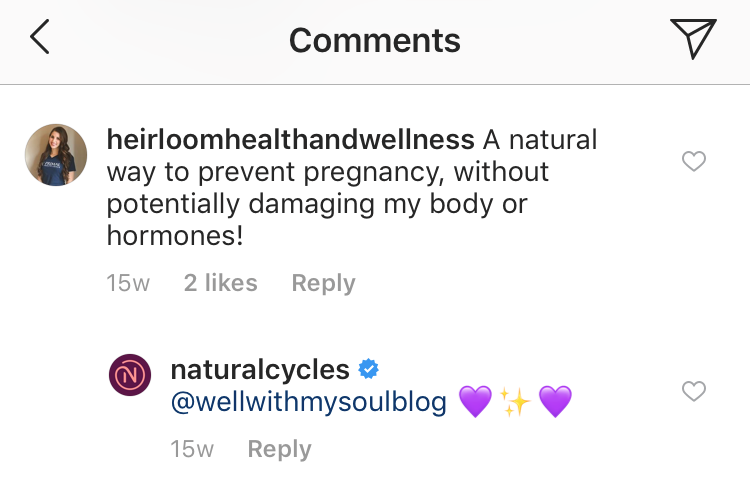 Likewise, while Natural Cycles is often careful to refrain from directly stating that “hormones are in any way ‘bad’ for women,” in Berglund’s words, the company’s social media outreach validates and amplifies its users’ language around “detoxing,” “damaging my body,” and “feels good to know I’m hormones free.” They are happy to let their users spread profitable misinformation with the company’s blessing—and trademark purple heart emojis. 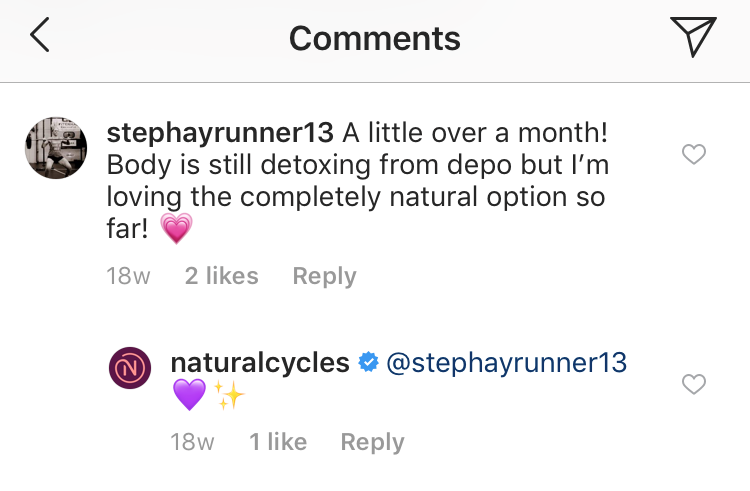 On its page for medical providers, Natural Cycles is explicit that “the right patient” is “engaged in healthy living” and looking for a “natural form of contraception that fits in with her healthy lifestyle.” And, of course, the company’s skillful marketing team actively uses nutritionists and yoga instructors to promote the idea that forgoing hormonal options is part of creating a healthy lifestyle on the Instagram feeds of young SoulCyclers, yogis, and vegans. In the new age of technology and connectivity, perceived personal well-being is valuable social capital. Instagram influencers—portraying themselves as the people who have their lives together, people to emulate—are paid to promote products that promote this lifestyle of self-care and all-natural remedies. Now, Natural Cycles has brought the FDA’s stamp of approval into this playing field.